Guys, I’m already dreading the end of the summer. It’s like middle school all over again. Because even though it is miserably hot and I’m desperate for fall weather to return, it also means the end of Pie Junkie’s Cheat Day and I’m just not ready for that. Kicking it with Darcy and Leslie pig-out style at some of Oklahoma City’s most decadent restaurants has been an absolute hoot, as was evidenced once again by our meal at Golden Phoenix. 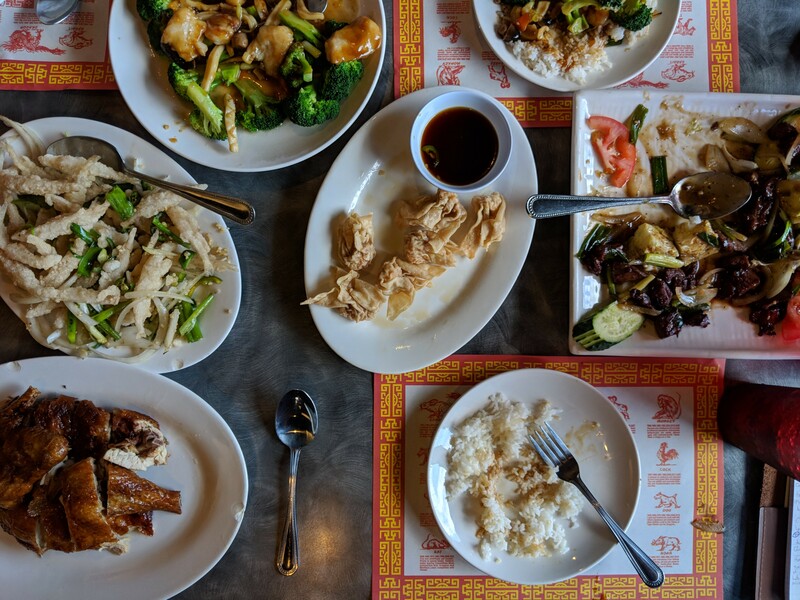 Located smack dab in the middle of the city’s bustling Asian District, Golden Phoenix serves a mix of Chinese and Vietnamese cuisine in a spacious and fairly elegant setting. This is a lovely spot for a big group meal, not only because there are plenty of tables, but because you’ll need a lot of people if you’re going to try even a fraction of the dishes on the menu. Thankfully, that same server decided to intervene and pointed us toward some of his personal favorite menu items, which were destined to become our favorites as well. I love dumplings. Potstickers, gyoza, whatever you call them, I’m on board. So it was a bit surprising when we were told in no uncertain terms that what we should get were actually the fried wontons ($5.95). Clearly, these take some work. They weren’t perhaps as beautiful to look at as your usual potsticker, but these comet-shaped dumplings were absolutely wonderful. Each one contained a big chunk of shrimp. 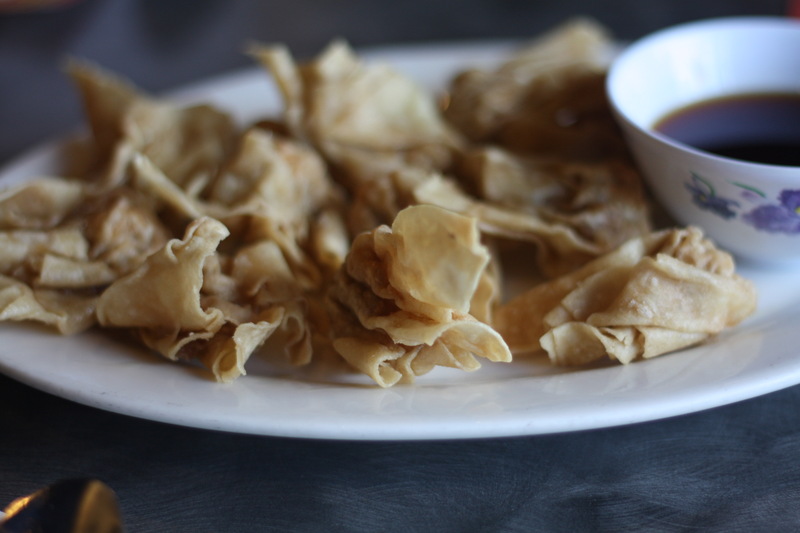 The wonton skin was fried to a perfect crispiness while the shrimp and other fillings remained flavorful and tender. Thank goodness we ordered a lot, because I could feel a fight brewing as the number of wontons dwindled. Don’t worry. The Sisterhood of the Traveling Pie remains strong, because we were immediately served an order of cubed filet mignon and garlic in butter sauce rice platter ($9.95). This dish is so good it’s stupid. I’m surprised it’s even on the menu. It should be like chips and salsa when you sit down in a Mexican restaurant, where it’s either figured into the price of the other foods you order or you get charged a set up filet mignon fee. What you get are crazy tender pieces of steak, drenched in garlic and butter before being grilled to a mahogany perfection along with some sauteed onions, both white and green. Do you remember that scene in “When Harry Met Sally” where Meg Ryan pretends to climax in a deli? That didn’t happen here, because we’re adults who know how to behave in a restaurant, but I definitely experienced a bit of the ol’ petit mort when I took my first bite. Yowza. Slightly less orgasmic was the seafood combination on rice ($7.95), though not for a lack of trying. 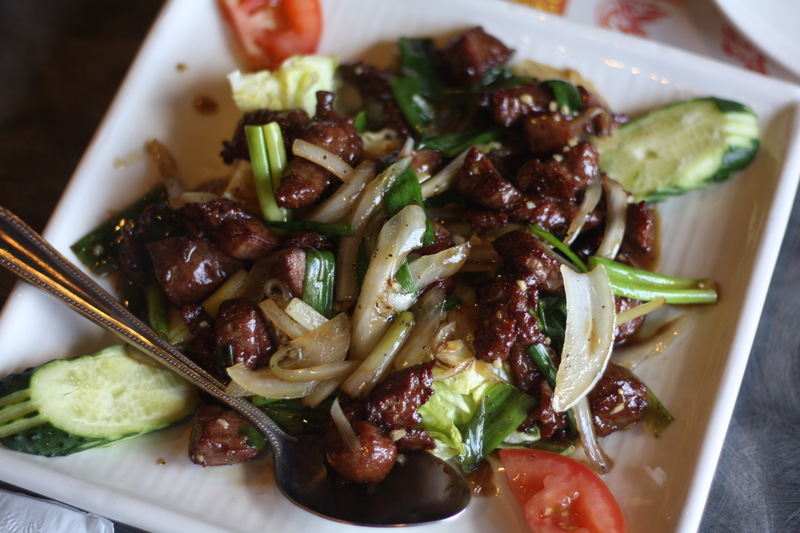 Our server clued us in on a secret — ask for it with brown sauce. I couldn’t identify every bit of seafood in there, beyond fish filet chunks and medium-large shrimp, but it was all gloriously tender and completely enrobed in that luscious savory brown sauce. Do you know the sign of a good meal? It’s one where you can’t stop talking about the food even while you’re trying to eat it. Maybe it’s just because the Pie Junkies run a restaurant and I write about them, but we were absolutely transfixed by the myriad of choices made by the kitchen staff that resulted in this entirely wonderful meal. 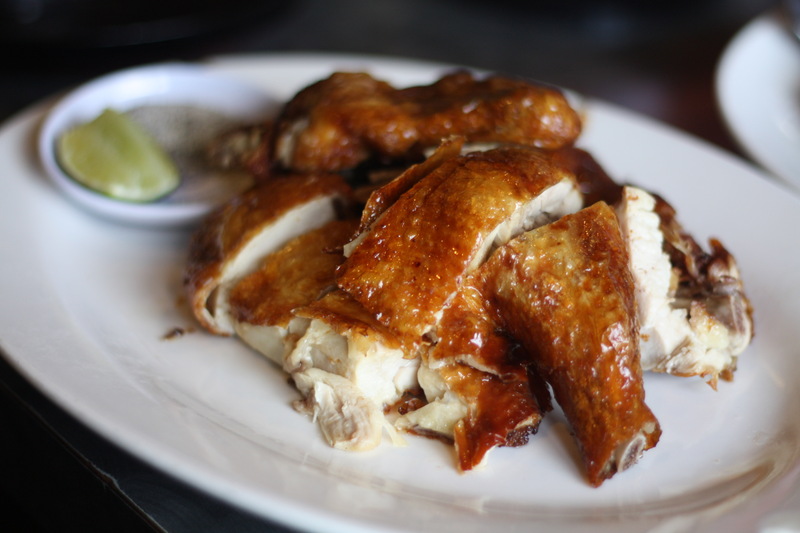 Take, for instance, the crispy skin roast chicken ($10.95 half or $20.95 whole). It hadn’t even occurred to us to try this before our server, basically a Golden Phoenix sherpa if ever there was one, pointed us to it. The chicken was juicy and the skin, as advertised, was so crisp I wondered if they’d asked for extra starch at the dry cleaners. The real revelation, though, was a tiny dish of salt and pepper and a lime. Tenzing Norgay told us to squeeze the lime into the dish and then dip the chicken into the seasoning. Holy wow, Batman. It was GLORIOUS. The lime-drenched salt and pepper clung to the chicken and sent a shock of flavor through my taste buds. The chicken was still front and center, but the acid of the lime and the savory salt blend accentuated the rich skin and tender meat. This is a must. Finally, we got one of my favorite treats: salt and pepper anchovies ($8.95). 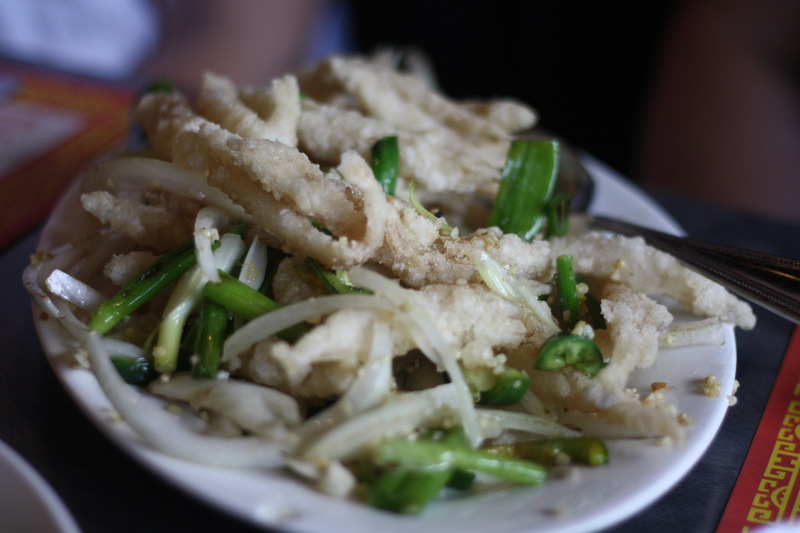 Tiny fishes are dipped in batter and lightly fried, then served alongside onions and diced jalapenos. 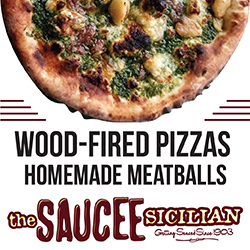 Anchovies are a touch oily and the jalapeno cut through that fat for a bright green flavor with just the right amount of afterburn. Texturally, it’s a wonder: it’s all snaps and crunches from the onions and peppers and a nice crispness to the fish. Lovely. Just absolutely lovely. You can go in and recreate the meal from A to Z and I think you’ll love it, but Golden Phoenix’s massive menu is a chance to go down the rabbit hole and try something new every time you go in. I adore drunken noodles, but with a selection like this, it’ll be several more visits before I return to that favorite. There’s just too much more to try in the meantime.